Gosh, the last two weeks have flown by. 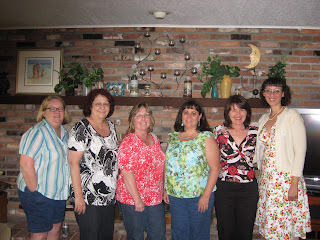 The week after Mother's Day, I got together with some Southern California Pattern Review Gals. They wanted to get together with Vonnevo too before she went home to Australia. Left to right: Kathi Rank, mastdenman (Marilyn), 1Betsy1, (Betsy), Me, Vonnevo (Yvonne) and LadyBeGood. Sue V and Karmeng (Lois ) also came, but left before the photo. We had so much fun sharing sewing stories, looking at Kathi's vintage pattern collection and just visiting with each other. Except Kathi, we all had on garments we made and that was really fun. Only other sewists could really appreciate it. Then last weekend I attended a Chickasaw Tribal Gathering. It was held in Bakersfield on just about the hottest day of the year. The Chickasaw ladies were wearing traditional costumes that they made themselves. 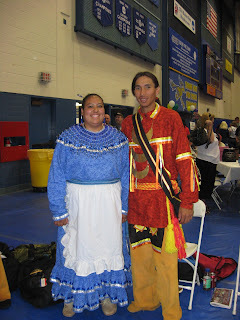 I'm not interested in having a traditional Chickasaw dress, but I thought you'd like to see it. All this is to say that I never had time to complete any of the garments for the mini-wardrobe contest. I don't know what I was thinking. I keep entering these contests and I keep failing to finish. You'd think I'd learn that I don't do well when working under pressure. 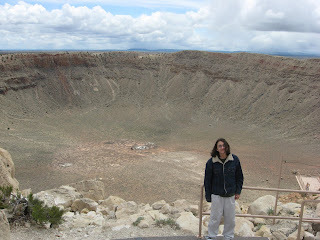 I'm only two days into my vacation, but I did take a great picture of meteor crater in Arizona. What a stunning site it was. I was a child when my parents would drive to Oklahoma every summer and we'd drive by off I40 and we never stopped. Finally at 46 years old I got to stop. Son thought it was wonderful. So did Husband. On Tuesday we are visiting Chaco Canyon and Wednesday we are visiting Mesa Verde. Then on Thursday we will be going to Canyon de Chelley. The Southwest is so beautiful. We live in such a stunning country. I'm so happy to share it with Son. He is enjoying the trip so far. We are staying in Farmington, NM while Husband attends the American Rock Art Research Association annual meeting. 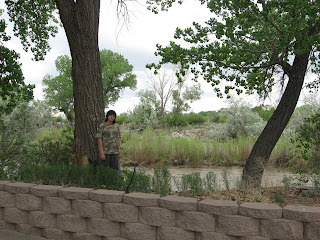 There isn't much to do in Farmington, but there is a really nice river walk behind our hotel that isn't bad. I probably won't have another opportunity to post before I get home. 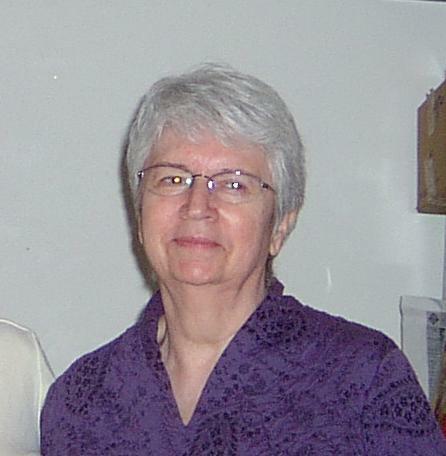 I really miss my mom, especially today. She went to Heaven on August 8, 2006 and I know she is with her Mom today. She looks so pretty in this picture because she is smiling. Mom never liked much to smile. I'm so happy I got this picture, taken only three months before cancer took her from us. We were all at my Aunt Vita's house in OK and we were having fun and laughing so hard. Mom was so sick and none of us knew it would be the last time we would be together like that. Today, Son and I are going to go visit my Dad. Husband is sick and wants to stay in bed. It's my day and I want to spend it with my Dad. He is dong especially well having to live without Mom. He's lonely but keeps himself busy. I'm very proud of him. I hope all you mother's have a great day today. Last night, Son and I went to Disneyland after work. Our season passes are about to expire and I wanted to get as much Disneyland in as I can. 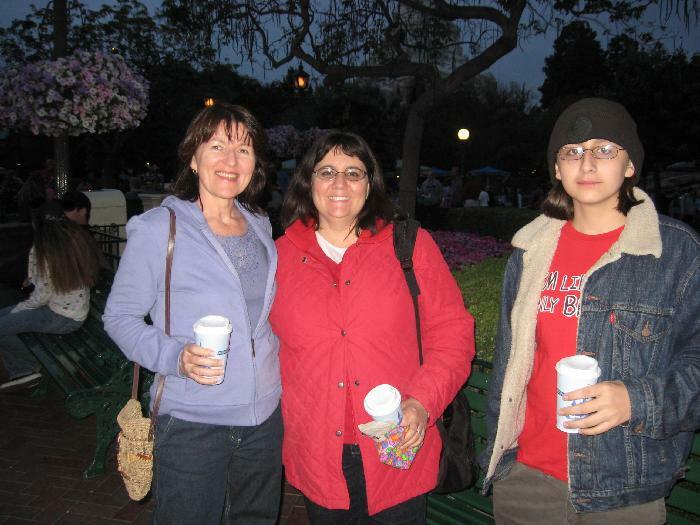 After we got there, I remembered that my PatternReview friend from Australia, Vonnevo (Yvonne) was in the States visiting Disneyland. So after a few calls, I found her and we met for a couple of hours. It was great to see her again. Today I attended a meeting planning for the first Los Angeles ASG event. I'm very excited because Peggy Sagers will be our guest speaker. We're having a trunk show and she will be discussing techniques with us. It's being held in Alhambra on June 14th. If you're interested, let me know and I'll get more information to you. After the meeting, SueV and I went to a new stitch lounge in South Pasadena called Sew Joe. It's a nice place where you can go and rent a sewing machine for $10/hr and sew. The owner has some neat things for embellishments and such. I think she likes to sew bags and has some for sale. She is looking for sewing instructors and I'm looking to teach. It was great to make a contact. I think this summer I can start teaching some classes if gas prices don't go up so high that driving to Pasadena makes it not worth my time. Then I visited a fabric store in Rosemead that SewShy told me about. I don't know what it's called. I don't recall even seeing a sign, just the word, "fabric" painted on the window. It was really a hole-in-the-wall place where their fabric was mostly rolls standing on the floor or piles of wadded fabric on the floor, kind of like in my sewing room. 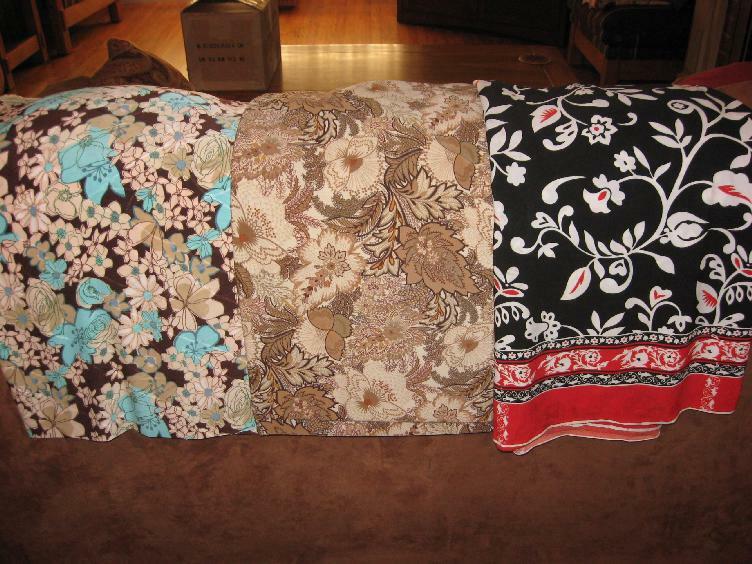 I found three pieces of poly knit that was pretty for $1 yd each. There were trims in jars on a shelf and a giant pile of zippers of all colors and sizes right inside the door. 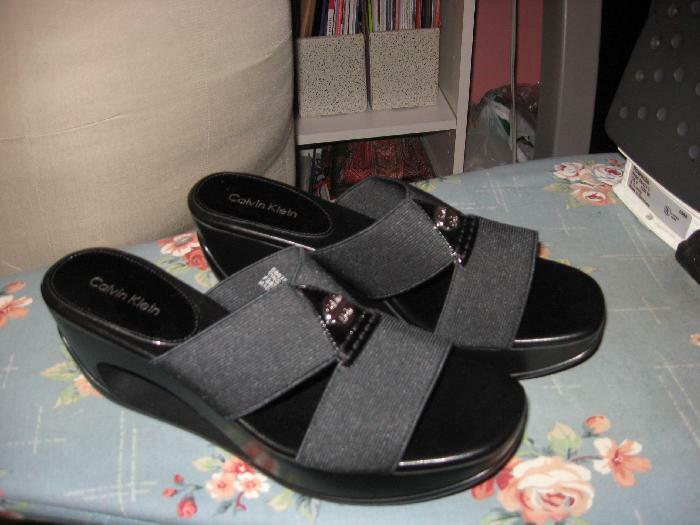 Then I stopped off at DSW and bought some shoes to go with my Wardrobe skirt. I found them in red and they were wonderful, but they didn't have them in my size. I had a sales clerk call several stores in the area, but none could be found in a red size 7. I was so disappointed. However, the black will probably go with more things. I have a pile of five books waiting until this summer for me to have time to read. On top is The Thirteenth Tale by Diane Setterfield. Page 123 is only one paragraph long and at the end of a chapter called, "In the Archives of the Banbury Herald." A fabulist. A liar. And the plea that had so moved me--Tell me the truth--had been uttered by a man who was not even real. So, I'm tagging Mary, Deepika, SewShy, Elaray, and LindaT. I hope I did this right and I really hope no one minds being tagged. How Did My Life Get So Busy? I'm starting to worry about getting the Mini-wardrobe done. I'm four weeks into a long-term assignment until the end of the school year as a 7-grade pre-algebra and 8th grade algebra teacher. Problem is, I can't remember my algebra. So, every night I have to come home and study, um....re-learn how to do the assignment so I can teach it. Worse yet is that they are at the end of the year and have more skills than I do. At least more than I can remember. In college I took math through pre-calculus. That was about 18 years ago. Besides the studying, I have grading and parent calls to make. Oh, and kids come in for help after school leaving me to do my lesson planning on my lunch break or on my own time after school. Tuesday, I was at work until 6 p.m. I think everyone needs to thank their kid's teachers for what we do since this is National Teacher Appreciation week. My weekends are full up with a Friday night trip to Disneyland, an ASG planning meeting, a drive to the mountains to see my Dad, a get together with Pattern Review members, a Chickasaw Tribal Gathering, and at the end of the month I'll be spending 10 days in the Southwest visiting Mesa Verde, Chaco Canyon, and Canyon de Chelly. We'll be staying in Farmington, NM at a nice hotel between car trips to each place. Needless to say, I won't be able to spend much time sewing this month. I am motivated to finish, however, because I'd like to wear these items on my vacation. 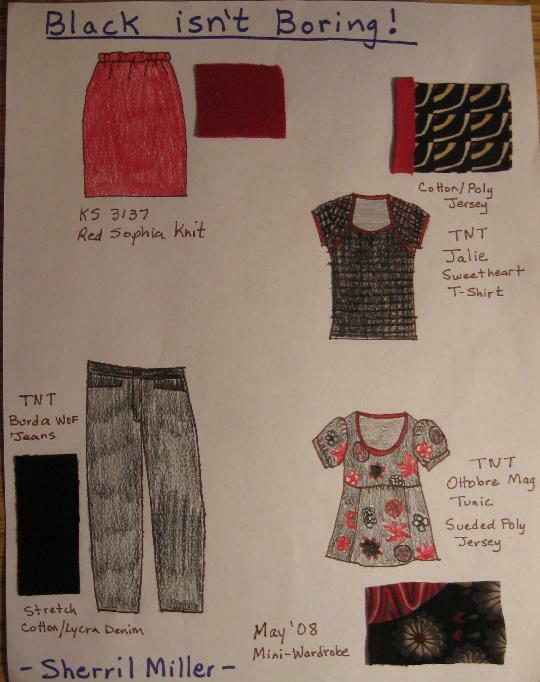 Good thing every one of my patterns are a TNT pattern, except the skirt. It's an easy fit so I'm not even going to do a muslin--GASP! The jeans will take the most time. I've sewn them up four times already. It's all the top stitching that takes up so much time. Maybe I shouldn't spend so much time on the computer and get to cutting out my fabric. Here's the storyboard. That, and washing my fabrics is all I got done on it all weekend. I hope to get the fabric cut before the weekend. What do you think?